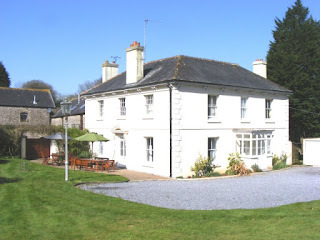 Set in a sheltered valley among the rolling hills two miles inland from Slapton Sands, a little further to the popular Blackpool Sands, Buckland House is an elegant Grade II listed Georgian farmhouse. Offering high quality accommodation for two or more families, tastefully furnished in keeping with the period of property, this lovely family home offers an opportunity to enjoy a holiday in comfortable surroundings and large private gardens. Downstairs: The entrance porch leads to the main hall, off which are the principal reception rooms. The south-facing sitting room has a traditional Georgian feel, with dual aspect windows that overlook the formal gardens. There is a wood burner, freeview TV, radio and CD player. 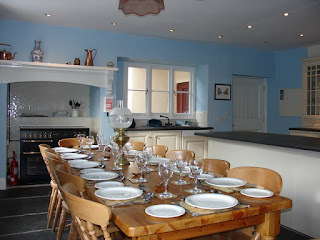 The large slate flag floored traditional farmhouse kitchen has a door to the garden, modern gas Rangemaster with electric ovens, microwave, dishwasher, fridge/freezer and food processor. The fully fitted furniture has plenty of storage and cupboard space. A peninsula unit divides the kitchen from the eating area which has a large dining table with seating for twelve, Welsh dresser, high chair and TV. Studio Flat: A ground floor studio apartment with small self contained kitchen area (microwave, fridge, kettle, toaster), TV/DVD, table, chairs and 4ft 6in double bed with en suite shower-room. It has views over the duck pond and orchard with a door to the patio; also access from the conservatory. Suitable for partially disabled. Logs for the woodburners are included as a starter pack, October to March and additional bags can be purchased at the local petrol stations. Outside: the large enclosed private front garden of 1 acre has private parking for 6 cars, with additional parking by the stable block. Patio and garden furniture. There are further grounds with barbeques and ponds with chickens and ducks.